The Department of English invites you to join a panel discussion on the use of comics as a journalistic tool. Dr Dom Davies - Lecturer in English at City, University of London. His is the author of Urban Comics: Infrastructure and the Global City in Contemporary Graphic Narratives (Routledge, forthcoming 2018) and the editor of Documenting Trauma in Comics: Traumatic Pasts, Embodied Histories & Graphic Reportage (Palgrave Macmillan, forthcoming 2019). He has also written a number of related journal articles and book chapters. Dr Julie Wheelwright - senior lecturer at City and programme director of the MA creative writing non-fiction. She is the author of Esther: The Remarkable, True Story of Esther Wheelwright, and The Fatal Lover: Mata Hari and the Myth of Women in Espionage. She also writes about the ethics of life writing and on other related subjects. 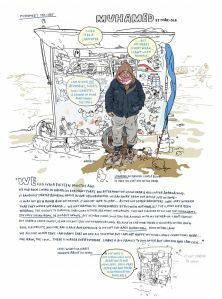 Olivier Kugler - born in 1970 in Stuttgart, Germany, and after military service in the Navy, studying graphic design in Pforzheim, and working as a designer in Karlsruhe, he now works as an illustrator in London for clients all over the world. His has since made graphic reportage for clients as diverse as The Guardian, Reader's Digest, The New York Times, The New Yorker and New York Magazine, among others. He was the overall winner of the 2011 V&A Illustration Awards and his work can be viewed on his website, http://www.olivierkugler.com/. Kate Evans - cartoonist, activist and public speaker. 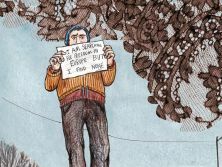 Her most recent book, Threads: From the Refugee Crisis (Verso, 2017) was widely acclaimed as an exceptional piece of comics journalism. Her previous work, Red Rosa: The Graphic Biography of Rosa Luxemburg (Verso, 2015), was voted best graphic work of the year by both . She has published a number of other comics, graphic books and blogs, that can be viewed here: www.cartoonkate.co.uk.